We have a B2B Phone System that is not complicated and boring. Great commission for a product that most Businesses need. 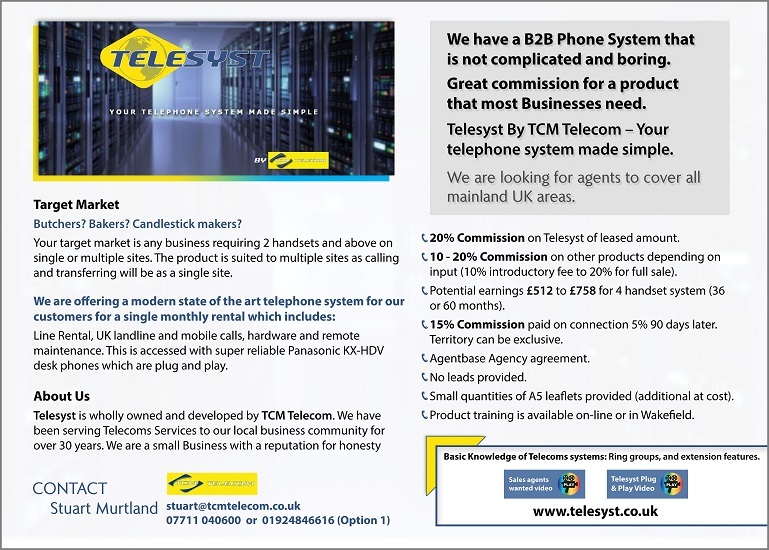 Telesyst By TCM Telecom – Your telephone system made simple. We are looking for agents to cover all mainland UK areas. Your target market is any business requiring 2 handsets and above on single or multiple sites. The product is suited to multiple sites as calling and transferring will be as a single site. We are offering a modern state of the art telephone system for our customers for a single monthly rental which includes: Line Rental, UK landline and mobile calls, hardware and remote maintenance. This is accessed with super reliable Panasonic KX-HDV desk phones which are plug and play. Telesyst is wholly owned and developed by TCM Telecom. We have been serving Telecoms Services to our local business community for over 30 years. We are a small Business with a reputation for honesty. 20% Commission on Telesyst of leased amount. 10 – 20% Commission on other products depending on input (10% introductory fee to 20% for full sale). Potential earnings £512 to £758 for 4 handset system (36 or 60 months). 15% Commission paid on connection 5% 90 days later. Small quantities of A5 leaflets provided (additional at cost). Product training is available on-line or in Wakefield.